Hey gang, many of you may not know that I am not only a strength and conditioning coach, but I am a pretty good cook as well. Over the years, I have created tons of delicious, healthy recipes for my clients and myself. Today I am sharing one of my favorites. These FISH BURGERs are easy to make, and taste great. Have them for breakfast, lunch, dinner or as a healthy snack. In part one of this article, we talked about the need for change in our fitness routines in order to spark new progress as well as keep motivation and enthusiasm at a high level. Let’s create some simple plans that will allow us to randomize our workouts a bit. I’ll tell you some of the things I have done and perhaps you can incorporate some or all of these ideas into your own approach. 1. Create 4 to six different strength routines and then alternate them regularly. We’ll call them A – B – C – D-etc. On week one you will do Routine A on Monday, B on Wednesday and C on Friday. On week two do Routine D on Monday, A on Wednesday and B on Friday. During the following weeks just keep rotating the different routines in and out of your schedule. Never do the same routine two times in a row. 2. “Run the numbers”. This is a really simple way to inject much needed variety into your strength routine. Let’s say you have about 10-12 exercises in each of you’re A-B-C-D routines. Instead of always doing them in a specific order say 1 through 12, or always starting with Squats, each time you go to the gym you start with the next number in the order. So the first time you do Routine A you go from exercise 1 to exercise 12. The next time you do Routine A you go from exercise 2 to exercise 1. This way you are always starting your workout with an emphasis on a different movement. This coupled with the fact that you are already rotating through 4 separate routines will keep your body guessing for quite some time. 3. Try varying your rep ranges and or rep cadence. If you always train the classic 5 x 5 (five sets of five reps), keep things spicy with some different rep ranges. Week one do sets of 4-6 reps. Week two do sets of 6-10 reps. Week three do sets of 8-15 reps. You can also vary your rep cadence, (the actual speed that you raise and lower the bar) I recommend 3-5 seconds to raise the weight and 3-5 seconds to lower it. If you are used to always moving the bar as fast as possible this decreased speed can really up your intensity and provide your muscles with a new and different challenge. At Hybrid Fitness we believe in training intensely. We also recognize that to avoid over training and reap the rewards of long term progress one must remain keenly aware of when it is time to push hard and when it is time to back off a bit. Learn to recognize the signs and symptoms of over training so you can cycle effectively and make uninterrupted progress from month to month. 5. Change the order and or intensity or your “Cardio”. If you always do Cardio training before strength training, then try doing them in the opposite order for a nice change of pace. Also as stated in part one of this article, you’ll get far more from your cardio training if you up the intensity instead of adding to the duration. So remember to challenge yourself. 6. Change the days you train. Train on Monday doing a long cardio session. On Tuesday do some heavy weights and some sprints. On Wednesday try a Total body conditioning class. Take Thursday off and on Friday start the whole cycle over again. As you can see at Hybrid Fitness variety is a key component to how we help our athletes stay fresh and continue to make progress for long periods of time. If you are looking for a simple tool to help you add fun and variety into your training routine check out our “Card P.T.” program. To find out more go here. For each workout below, do one set per exercise. Vary reps as needed, for desired results. Rest 30-90 seconds between sets. We all know the age-old adage “Variety is the spice of life”. Many of us also have first hand experience with this concept as we have made simple changes to some aspect of our daily lives at one time or another and quickly noted the renewed enthusiasm that often accompanies such changes. In many instances some simple changes to your fitness routine are just what the doctor ordered to breath new life and progress into an other wise dull, stale routine. If you have been consistently and regularly exercising for six to eight months or more, your body has become accustomed to the stress of exercise. Many of us notice rapid improvements when we first begin a fitness routine only to see those improvements dry up and disappear in just a few short weeks or months. Why dose this occur? What can we do about it? Read on and I’ll tell you. First of all lets hear it for our bodies. They are amazing marvels of biomechanical design. To see and feel them functioning at their peak is truly an experience of splendor. We don’t always treat them as well as we should and yet they continue to try their best for us no questions asked. If we give them good fuel, keep up with some basic regular maintenance and get out and move them around a bit they will reward us with years of hassle free service. Just about any physical challenge we humans can dream up can be overcome by these amazing machines we call our bodies. Modern society is one of convenience. Exercise literally used to mean life or death for us. Now it has become just one of many activities we are trying to find time for in our busy lives. If you are reading this then you have probably found at least a little time for fitness in your hectic schedule. But are you having fun? Are you branching out and trying new things? Does your workout routine have any spice? If you answered no to any of those questions, fear not for I am here to help. Getting spicy is a lot easier then you may think. Lets back track for just a second. As I said above, the body is amazing. It likes us to be able to accomplish our tasks with energy to spare. This is a self-preservation tactic. If our bodies did not find ways to maximize efficiency then we would use up too much of our valuable energy resources trying to accomplish the most basic daily tasks. Instead, our amazing bodies continue to increase the ease and efficiency of executing these tasks and finds ways to use less and less energy to accomplish them. When we are learning a skill such as a racquetball serve or throwing a right hook punch, we want our bodies to become better and more efficient over time. This allows us to execute the skill with maximum efficacy. For fitness however, we want to avoid this process. If we stay on the same old routine our bodies will get better and better at accomplishing the task while expending less energy to do so. In other words, the longer we stay on the same fitness routine, the less effective it will become for us. So, how do we fix this problem? How do we keep our bodies from adapting to our routine? Step one; try something new. This seems like a no-brainer but so many of us have become creatures of habit. We plod along in the same old routine, day in and day out…Blah. On a side note, if you have been doing some routine for three months and it is not producing the results you expected or desired, it will not suddenly and miraculously start producing results in the fourth month. Trust me it wont. So, it is time for a change. If you love to do cardio training and always walk on the treadmill, branch out. Try using the rowing machine or jumping rope. Use a different stair machine then usual. It could be something as simple as trying a different program on the same machine. If you always do the “Fat Burn” program try “Cardio” or “Intervals” for a change of pace. As a general rule of thumb, you’ll get far more benefit from increasing your intensity then from increasing your duration. So, go on up to level 10 instead of adding another ten minutes to your workout. If you are a strength-training zealot, then the same applies to you. Change your routine frequently. Use a different angle for the same general body part (going from flat to incline on your bench press). Use a different machine. Change the order of your exercises. Change your repetition range. If you always do 8-12, try 6-8 or even 4-6. As with the cardio training it is better to increase intensity rather then increase volume and or frequency of training. If you have been stuck at a plateau for some time, it is likely you need to take a few days off from training and then come back at it with a new and different approach. Try training harder but less often. Split your routine in a new way or switch to whole body workouts for a change. Remember, to get the most from your strength-training routine it should be brief, intense, and infrequent. If you consider yourself a cross-trainer and mix things up between weights, classes, cardio etc, you must still take a close look at your daily, and weekly “routine”. If it is routine, then as I mentioned above, it’s time to shake things up a bit. In part two of this article we’ll dig a little deeper into how to add variety to our training routines. TAKU’s NOTE: This week features an excellent article from my good friend Steve Mckinney. Steve is an awesome Personal Trainer, and runs studios which offer personal fitness training in the following areas: St. Louis, Clayton, Ladue and St. Charles, Missouri. Along with Edwardsville, Maryville, and Glen Carbon, Illinois. I highly recommend that if you have the chance, you book a session with him, and don’t forget to tell him TAKU sent you. Think about it. If you want to be a great 3 point shooter in basketball what should you do? If you said A or B please don’t read any further there’s no help for you! Just kidding. It just should be obvious the correct answer is C.
To me it just seems obvious, to get better in my sport I must practice that sport particularly/specifically over and over and over again. In my 20’s slow pitch softball was big in the Midwest. I played on some local teams but there was a team based in St. Louis that paid their players. I wanted in on that! So here’s what I did. Every chance I could I recruited guys to practice with me. I got about 50 balls and I would make sure I had 3 guys, a pitcher, a hitter and an outfielder. We all changed positions. 1-2 hours per day, 4-5 days per week of hitting and catching and then playing games every night. Guess what? Within 2 years I was like, “show me the money!” For the next 5 years I traveled all over the country playing the best players’ week in and week out. I know the evidence I just gave you is anecdotal but that’s how I learned. I became my own trainer by experimenting. I still do. I then advise others and track the results making adjustments when necessary. The question then is, “Are there other things I can do to help?” I’m glad you asked! There are. You should know I’m an advocate of High Intensity Training or H.I.T. for short. Strength training using H.I.T. methods while practicing your sport will really make a difference in your training. It allows for more time to specifically practice your sport. This specific training is called motor learning. Motor learning ideally transfers positively to your game. This concept of transfer can have different affects on your training. However it can have a negative affect also. Allow me to explain. I’ve seen people jumping rope to improve coordination or throwing a lead ball to help strengthen your arm, etc. In my experience the only thing jumping rope improves is ones ability to jump rope! Same with the lead ball throw, it makes me better at throwing a lead ball. But not a better pitcher, it would actually make me worse. That’s negative transfer. My softball example above is what I consider positive transfer. Ellington Darden writes about 3 types of transfer: Positive, negative and indifferent. Positive transfer helps your sport whereas negative transfer hinders it. Indifferent transfer is just that, indifferent, and has no affect on your game. That brings me to strength training. Strength training is indifferent in that it has no affect on the skill levels of your game. It will only enhance your game, if, while your strength train you practice the skill part of your game. If you just strength train without skill training you’ll get stronger but your skill levels will diminish. In conclusion let me give you some simple tips on improving your game. Practice your game specifically. If its basketball shoot then shoot, shoot and shoot some more. If baseball, then hit, hit and hit some more. Enhance your game by getting stronger using H.I.T. methods of strength training. Critically think about any advice given to you by experts. Don’t accept everything told to you. Most people try to add everything to their training except training itself. Philbin, John (2004). High-Intensity Training: more strength and power in less time. Human Kinetics. ISBN 9780736048200. 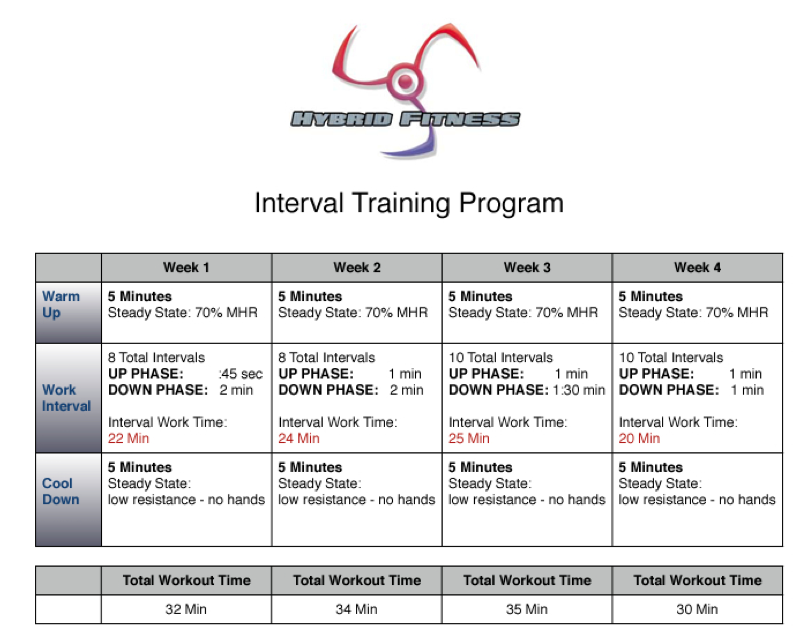 This interval program is designed to be performed 2 – 4 times per week on a Treadmill.